After years of trying to get a cheap workable storage and backup solution for our importanthome files I finally broke down and bought one of these last week. Some years back I had abad experience with an early Netgear NAS so I was a little leery of home NAS solutions, buta disk failure and continued frustrations with XP network sharing had left me despondantand desperate for a solution. I had heard nothing but good things about Buffalo, and MicroCenter had these on sale, so I gave it a whirl. Oddly enough Mr. Grey Ponytail the MicroCenter worker almost talked me out of it by giving me incorrect info about the product. Ponytail insisted that this device needed client software installed on every PC that wouldaccess it and that it wouldn't just show up as a windows workgroup member. Turns outhe was only impersonating a geek and had no idea what he was talking about, it doesn't needclient SW and it does show up as any other network device would in windows. Anyway, the setup went relatively smoothly with only a minor glitch and a stupid one at that. More...Buffalo's utility installer software needs to "find" the machine on the network, if it can't, the installer doesn't finish - better design would be to finish installing the utility SW and then run a config program. 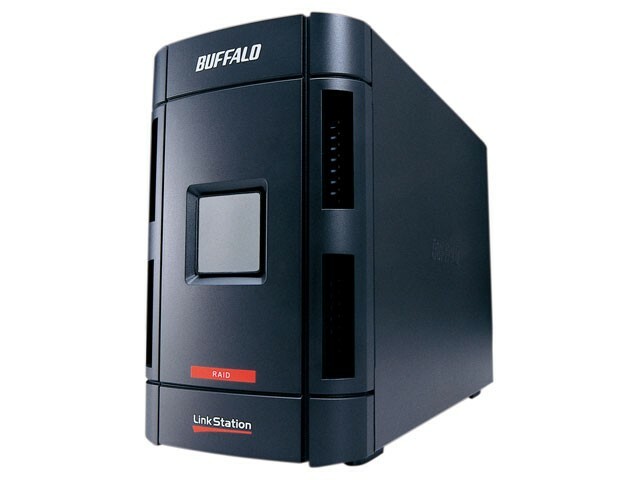 Buffalo's documentation is pretty much crap as well and doesn't even include instructions on how to swap a drive in the even of a RAID drive failure. The product itself isas advertised and exceeded my expectations for performance even on RAID 1. I also found theconfiguration using the web control panel comprehensive and well done. Considering thatthe LinkStation is only a bit more expensive than a 2 Tb USB external drive, it kindof a bargain.I'll update this post if anything untoward occurs with the box in the future, but so far so good.